Here’s a thing… what am I trying to describe. Something I appear to have writers block with……..
Having just spent some time on the telephone with Maggie, a guest of Riad Laksiba; who had enthused so much about her trip to Marrakech and her stay at Riad Laksiba that she felt obliged to telephone directly; for me to share in her enthusiasm. Then Maggie hit a small crossroads. “What is it am I trying to describe” came the question. “I know what you mean” my weak answer. This particular guest of Riad Laksiba is a battle-hardened traveller and a regular visitor to Morocco. Her knowledge extensive; spanning four decades. Maggie has seen many changes to Marrakech; mostly good, some things indifferent, and the traffic in Guilez the new town notably bad, from her past recollections. The most significant observation was based on accommodation: “In the 70’s; Riad’s were so appalling inside, especially sanitation, that it made them a very Bo-ho (bohemian) choice; I loved to invite the London-set over to see how I was living. Nowadays the interiors have been turned into pseudo-boutique hotels; with gift shops”! Uber-urban chic, international interior designed, highly sophisticated client expectation, a current fashion trend, artistic freedom…….. Riads offer the lot ! But that was Not what Maggie was looking for. Maggie was not looking to retrace her footsteps to stay in a 1970’s slum BUT equally she did Not want her past memories compromised by taking lodgings in the land of flat screen TV’s, mini-bars, a subordinate restaurant, reception, foreign exchange, remote controlled curtains, dimmable lighting and a power-point specifically for an electric toothbrush! 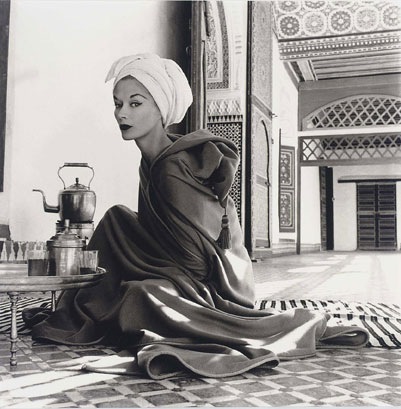 “It became almost an obsession to find what I call ~ a proper Riad ~ Not one with Andy Warhol styled pop-art images, of the owners wife; with furnishings that looked like they had been shipped in from Milan”. Authenticity with a few added modern comforts; a decent shower, sit-on toilet with maybe air-con & wi-fi; appeared too much to ask. Something clean, something real… that gave the feeling of being in someone’s home. Yes… “a home from home”. Then, by chance, Maggie stumbled across Riad Laksiba on the internet. 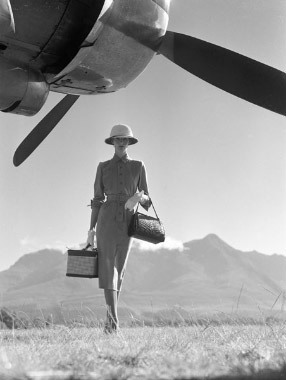 It looked a hopeful compromise; coupled with a budget Soft-Launch promotional price Maggie booked, just the first 2 nights of her trip; with a view to seeing if she could find what she was looking for when she arrived. “I decided that I would have a better chance of finding my authentic Riad on-the-ground by walking around and asking the locals”. Maggie booked 2 nights: but stayed for 10 nights. She had found what she was looking for….. 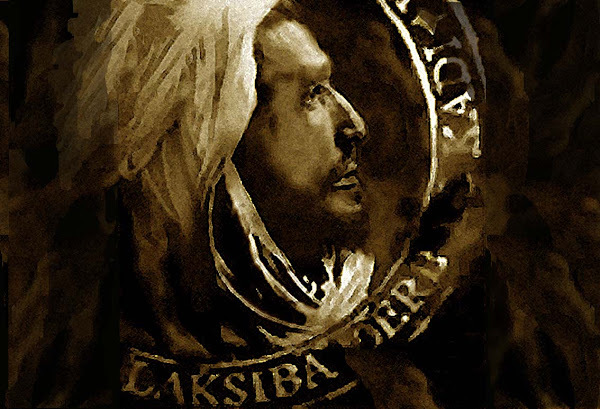 But what is it that makes Riad Laksiba real? I know what she means but only by default. Riad Laksiba has no TV, no furniture from Milan, no mini-bars and no pop-art. It does have Monopoly (Moroccan version), air-con, wi-fi and a toothbrush holder in each en-suite…….. It is located in an ordinary street with ordinary people going about their daily lives. The interior offers no Euro-fashion statement. 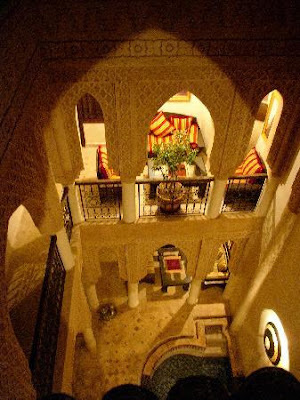 Restored in “Old Palace” style; reflects its location in the Royal Imperial Kasbah district. 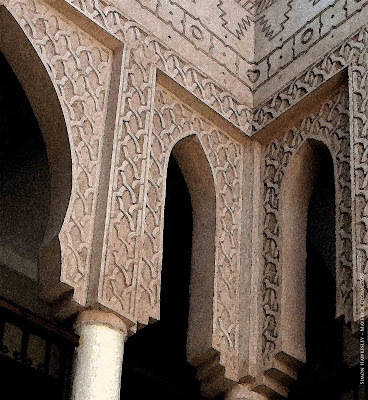 The walls; the same colour & material as the Kasbah Mosque, an Ivory Cream, tadelakt plaster. The internal courtyards stone fresco; representative of the minaret of the Kasbah Mosque. The floors; a simple, terracotta bajmat, tile similar to the El Badi Palace, the bathroom shower tiles; glazed zellige, or zellij, and the doors and window shutters; carved cedar with Berber motifs, similar to those of the Bahia Palace. The outside façade of Riad Laksiba; rendered in a similar fashion to the rampart walls, that surround the UNESCO World Heritage Medina, where Riad Laksiba is situated. Maybe the definition that Maggie and I struggled to find was “Style”. Restored in “Old Palace” classical, timeless style; and maybe Maggie was trying to purvey a comment that Fashion comes & goes; there is no accounting for taste; but style is an ingredient that is difficult to describe but remains timeless. Now it is your turn. Riad Laksiba is looking for definition in a few simple sentences “What it is…. that makes it…. what it is”? How does one describe something that feels more architecturally authentic; to ones perceived imagination than its counterparts and contemporaries? If you were coming to Marrakech and wanted the cultural “real deal” then how is that best described? Entry: Please add your entry to this article. You are not restricted to the amount of entries but all entries shall be moderated before they are published. Do widen this competition to your friends. Chosen Caption: The chosen caption shall become the “Strap Line” for Riad Laksiba. The author of the chosen caption will be given the opportunity a to stay at Riad Laksiba as our guest (up to 2 people, bring your partner) for a long weekend. The author will be notified by e-mail and then we will put dates in the diary. Package: Accommodation/ Breakfast/ Airport Transfer from/to Marrakech Airport included. My hope of a Real Deal would be Past meeting Present. Traditonal Style blended with modern sympathetic Style , Riad Laksiba gives the Best of Both Worlds enabling guests to feel part of the Community. No sentences needed I think this sums it all up. It’s what I specialise in and a few years ago I recognised the need for this trend.